ChristineCreations: A Rad and Retro TCP Blog Hop! 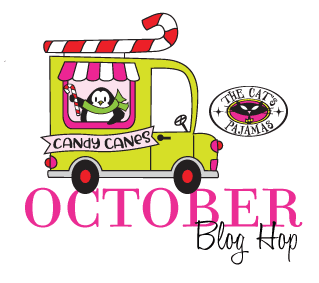 A Rad and Retro TCP Blog Hop! It’s New Release Time with The Cat’s Pajamas! 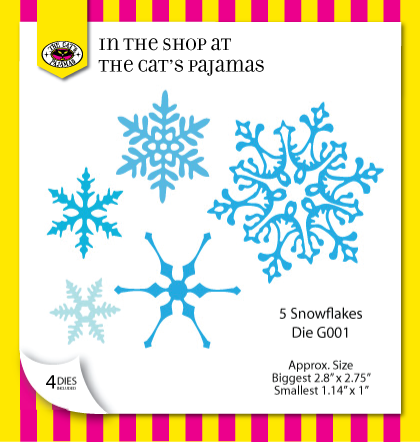 Our three new stamp sets and four dies are now available in the store! To celebrate, we’ve got one more look at all the fun with our Blog Hop today! If you were just inspired at Nancy’s Blog along the hop, you’re on the right track, but if you get lost anywhere head on back to the TCP Blog for the full list. One of the things that first drew me to TCP was the retro feel of Sprinkles, Poochie, the Penguins, PJ....they all play together so nicely in a MOD fashion. 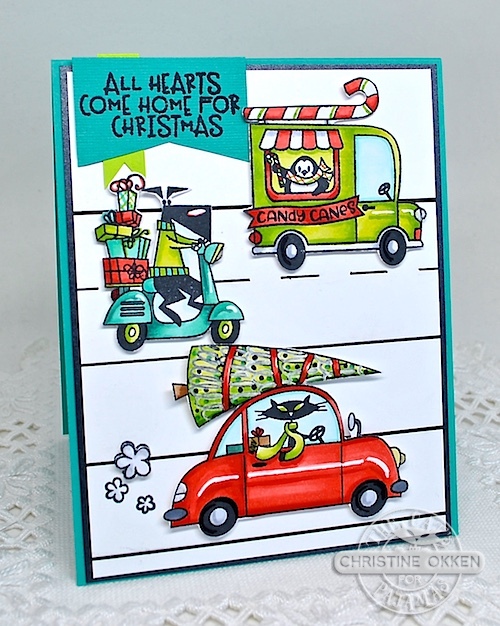 As soon as I saw this set, North Pole or Bust Stamp Set, I knew I wanted to create a 60’s mod highway scene with all the cute vehicles included in the set. It was way too much fun to envision this card in my head and then see it come to life! I’ve stamped out all the elements on Copic XPress It Blending cardstock, coloured with Copics and then I trimmed each of them out. On white cardstock, I penciled in the roads, then inked them over with a black Micron pen, then popped them all up to look like they’re scooting home for Christmas! There’s some white gel pen to make highlights on the vehicles, some exhaust from TCP’s other set, Flying By. I was thinking retro colours and patterns here again with the gorgeous J*y CutUps Die and the Snowflake Border CutUps Die. I started by smooshing some Distress Oxide and Distress Ink onto cardstock, spritzing, heat setting and repeating. 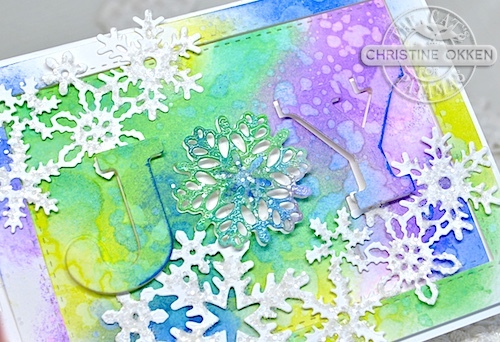 Then I added glassy glaze and chunky glitter to the snowflakes to really make them sparkle. It is SO shimmery in real life! Here’s another peek at what you can get in the store starting today! 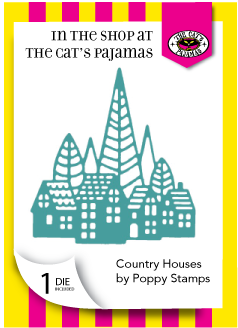 The Country Houses die will be FREE with any $65 purchase. Now you can head on over to visit the lovely and talented Julee! I’m so excited to have her join us this month! I know you’ll be wow’ed again by her work! Thanks for joining us today! 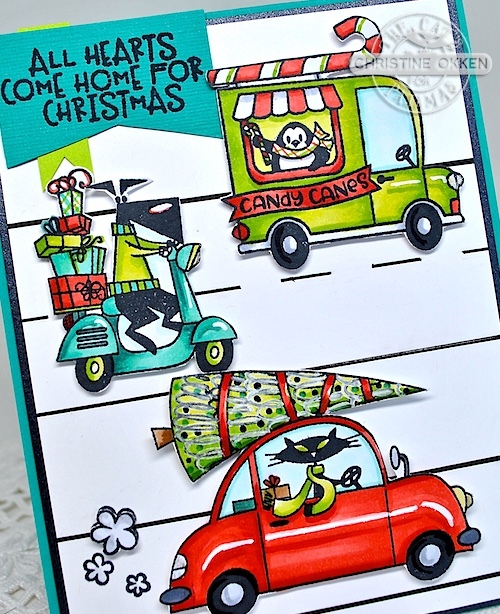 I don’t usually like traffic, but your great card with the three critters just makes me smile. Stunning Lynn. 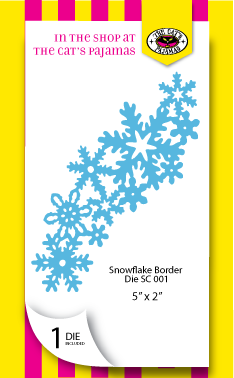 GREAT idea to turn the Snowflake border on it’s side. It really looks so pretty with the glittery embellishments. Oh that highway scene is purr-fect, Christine! Such a fab card! And the colorful joy card has stolen my heart. Always inspired by your beautiful creations! Wee...Now, that is quite like my commute each morning! LOL. So adorable! Love your pretty and colorful JOY card too! From cute to pretty, you can do it all! 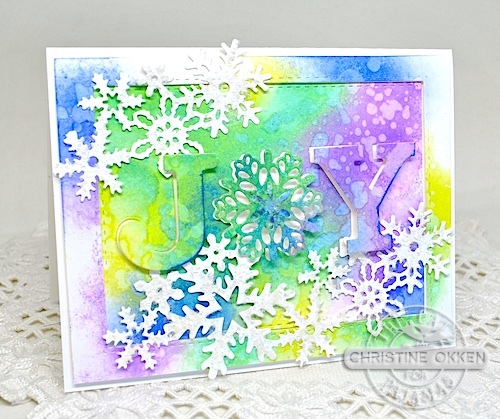 Christine, that oxide ink background is gorgeous! That card with the critters on the road is awesome!!! Great cards Christine, love both of them, but the J*Y card really took my breath away! Your road trip scene card is amazing. 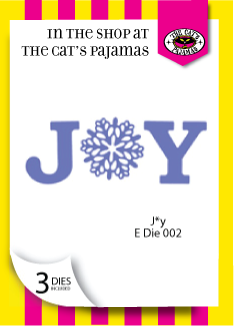 And on my, the colors on the Joy card are so pretty. Two fabulous cards! Love the fun and whimsy of the first one and the gorgeous watercoloring on the second one!